Microsoft celebrated its 40th birthday in April. That’s pretty impressive in an industry in which most companies aren’t built to last. The only problem is, technology companies aren’t necessarily prized for their longevity. “This industry doesn’t respect tradition,” says Jeff Hansen, BA ’93, who heads Microsoft’s global branding efforts. “The industry respects innovation. Microsoft has a great heritage, and we have been very successful. Surveys show over and over that we are among the most respected brands in the world. But we have to remain focused on what we can offer in the future.” Branding, Hansen says, is built on a deep understanding of qualities that make a company distinctive, and then enacting that “personality” out in the world. But even after a few successful decades, corporations need to be ready to try new things. Hansen sees his role as finding ways to match Microsoft’s tremendous strengths with what the public is seeking at any given time. “My job is to be the voice of the customer,” he says. At the UO, Hansen majored in psychology and sociology and planned to spend his career researching the criminal mind. What hooked him on branding? “I love the craft,” he says. 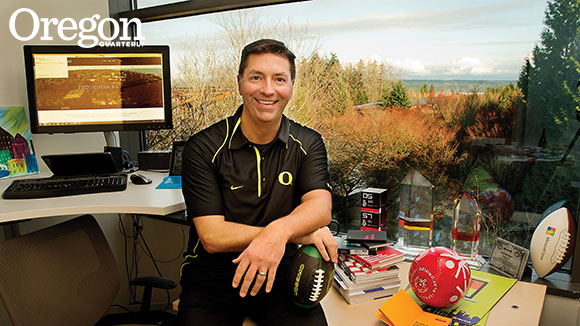 At Microsoft, Hansen leads an informal network for Ducks, using an e-mail listserv and occasional social gatherings to help Oregon alumni network and keep in touch. Under Hansen’s guidance, Microsoft has recently launched partnerships with the Special Olympics, the Nobel Foundation, and the Real Madrid soccer club.